The Downside Of Keeping Interest Rates So Low For So Long : The Two-Way Some economists say the Federal Reserve should leave rates alone, but many say super-low rates have big risks, too. They argue that the central bank needs to push rates back up to historic norms. 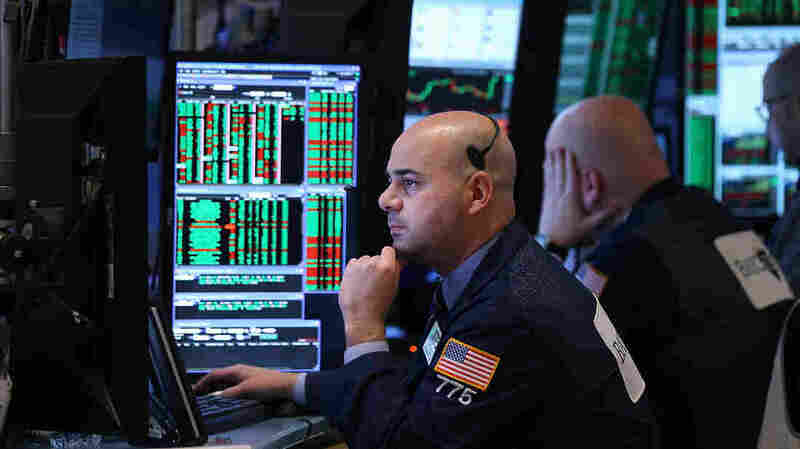 Traders work on the floor of the New York Stock Exchange in March. Investors have been waiting to see whether the Federal Reserve will raise interest rates for the first time since 2006. The last time the Federal Reserve raised interest rates, it was summer of 2006 — back when Shakira was topping the music charts, Barry Bonds was breaking home run records and the housing bubble was still inflating. That's quite a while ago. In fact, the Fed has been depressing interest rates for so long that, in their adult lifetimes, millennials have never seen anything other than cheap loans for homes and cars. That could change this week if the Fed were to end its two-day meeting Thursday by announcing a rate increase. The change, should it happen, could jar borrowers who have come to expect historically low, stable interest rates. Historically, Fed policymakers raise rates only when economic growth is accelerating so quickly that demand is starting to outstrip supply, causing prices and wages to inflate. But over the past 12 months, consumer price inflation has been running at just 0.2 percent, far lower than the historic norm of 3.2 percent a year. "There is no inflation on the horizon," Jerry Jasinowski, an economist and past president of the National Association of Manufacturers, stated in an analysis. "The big challenge facing the U.S., and indeed the world, is not inflation but weak demand" for goods and services, thanks in large part to China's slowdown, he wrote. Jasinowski said that in today's low-inflation, low-demand environment, "there is no compelling need for the Fed to raise interest rates. Indeed, it would do considerable damage to no viable purpose." But others disagree. "Keeping interest rates low for prolonged periods of time imposes distortions on the economy," Peter Morici, an economist at the University of Maryland, said in his analysis. And after so many years of growth, Americans "no longer need support from rock bottom interest rates." So the two sides are squaring off this week, each making its case to the Fed policymakers. Perhaps to most Americans, the argument in favor of low rates is obvious and compelling: It's really helpful to get a cheap car loan and a more affordable mortgage. Why mess that up? The Fed Needs To Reload. When the economy is in trouble, having the nation's central bank cut rates can help. That's exactly what the Fed did starting in 2007. It cut and cut until the federal funds rate was near zero in December 2008. But if rates already are as low as possible, then the Fed doesn't have that weapon available to fight off a recession. So it must raise rates during better times — just to prepare for future hard times. 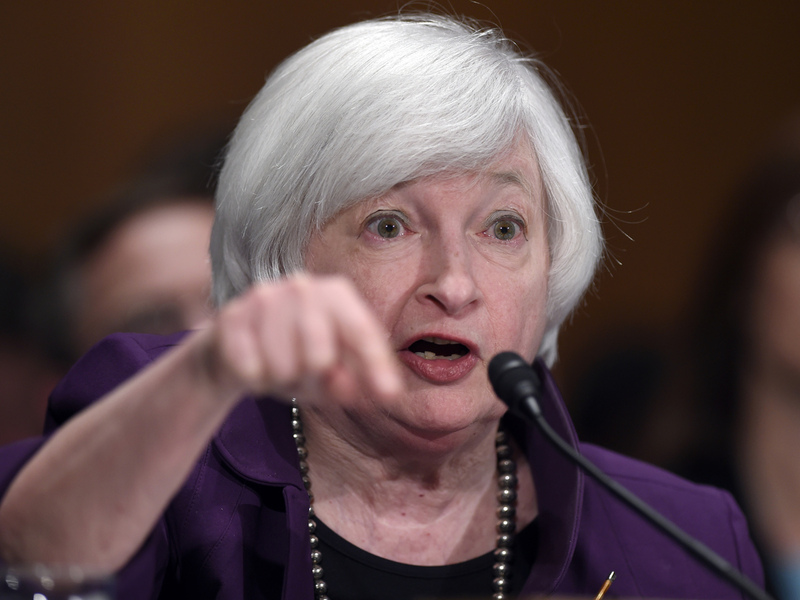 Federal Reserve Chair Janet Yellen testifies before the Senate Banking Committee in July. This week, Yellen and other policymakers are weighing the Fed's first rate increase in nine years. Savers Need A Raise. Super low rates may help borrowers, but they hurt the people who have deposited money in banks, and who need to earn interest payments. The low rates have had a devastating impact on the incomes of many retirees. And they have hurt the big pension plans that can't earn much from safe investments. Assets Prices Need To Cool Off. Because pension plans and other savings plans can't earn much interest, they have been going out in search of higher income, which means moving into riskier assets. So instead of depositing money in banks and patiently investing in safer, lower-growth areas, they have been shifting cash to riskier, higher-growth investments. But many of those assets have been getting overpriced and volatile. Bad Investments Create Excess Supplies. We're already seeing problems with distortions caused by too-cheap loans. For example, companies borrowed lots of money to expand more quickly. They were hoping that by planting, drilling and mining more, they would reap big profits. But then China's economy cooled, and now many commodity companies are crashing because the world is awash in oil, coal, wheat and so on. Low Mortgages Lead To Housing Bubbles. Many hot markets, such as Manhattan and Silicon Valley, have seen housing prices shoot to levels so high they may be giving rise to a new bubble. The Fed's policymakers will be meeting on Wednesday and Thursday, weighing whether to begin the process of slowly, systematically pushing rates back up to more normal levels. Analysts generally are saying the odds of a hike are declining because inflation is so subdued. In any case, Fed watchers will rush to Twitter to spread news about the decision. The last time the Fed raised rates, they did not do that. The last hike was in June 2006. The first time you could tweet was July 2006.